This post is the start a story of a man whose life and family history combined two of my passions, the Civil War and University of Kentucky basketball. It was going to be one single fun post, but I kept finding more sources and more information, so It will take a few posts to tell this whole tale which has become perhaps my favorite project I've found for this blog. 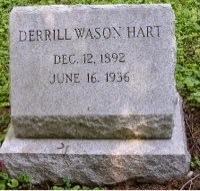 I start here with a biographical sketch on Derrill Wason Hart, and will follow it with other posts detailing his connection to the Civil War (and, thus, this blog) as well as some of his family history. He also played varsity tennis for the Wildcats and apparently on club teams in baseball and football. Details about his life are available through several sources, including the reports of his death. Here is his obituary (from the Lexington Herald, found on his profile page at Jon Scott's incredible Kentucky Basketball History Site. Thanks to Jon for looking through his information to find this name and his tie to the Civil War, allowing me to begin my research.) His obituary from the Brooklyn Daily Eagle also provides valuable information. He graduated with a Bachelor of Arts degree in English in 1912 from UK, where he was a member of the Sigma Chi fraternity. He spent a few years teaching in Lexington, then held a fellowship in English in 1915 before earning a Master's Degree in 1916. (His masters thesis was entitled: "A Philological Study of the Kentucky Mountaineer, as based upon Surnames and the Vernacular.") He joined the navy around the time of World War I as an apprentice seaman before obtaining the rank of ensign two years later. One document on UK's website mentions a "base hospital unit 40" by his name, on a list of UK alumni in the military, but I have not yet found where that was. His draft registration card (a copy of page 1 with his signature is below) shows he was tall, of medium build, with brown hair and blue eyes. He was still single and teaching school when he completed this form, which is dated June 5 on page two. No year was listed, but the first national registration for this war was on June 5, 1917, for men of ages 21 through 31, such as Derrill. The question concerning military service and rank remained blank, creating questions about exactly when he served in the navy. One obituary says he joined the navy in 1916. This was before he signed the registration form, so why did he not complete that section? Perhaps the obituary was incorrect, misremembered by his widow or sister. Maybe not answering it was just a mistake. Another possibility is that someone else completed and signed this in his place and did not know the answer. If he did fill the form out himself, was avoiding a possible draft motivation for him to join the navy? After his military service, he settled in New York and found employment in the publishing industry. He worked at Doubleday, Page & Co., for over a decade, publishing what became the American Home magazine. He developed a strong interest in dahlias, raising them at his sister's house in Garden City on Long Island, (where Doubleday Page's operations were headquartered) and turning that interest into expertise. In 1921, he began publishing an annual honor roll of new dahlias. He accepted jobs at both the New York Sun (as editor of the garden section) and the New York Times and eventually became the advertising manager at the Flower Grower magazine. These jobs probably allowed him to continue pursuit of his passion for dahlias. In 1931, he helped establish a dahlia garden as a gift to the engineering school at UK, as he was a friend of that school's dean. This garden, near that school, later became a southern proving ground for dahlias and held 120 specimens. A September 1931 article in the university's student newspaper, the Kentucky Kernel, described the the garden in rather romantic terms: "Entrancing beauty, grace of form, and a wealth of loveliness; a selection of bloom in a spectrum of coloring; a spot wherein one may spend an idle hour wandering among the royalty of nature." It also stated that Hart was then the Chairman of the Executive Committee of the American Dahlia Society. UK's website, www.uky.edu, has two pictures of the entrance gate to the garden. The second one shows Derrill standing between two professors, though the page inexplicably names him as "Terrill Hart." (That may have been due to how the newspaper was scanned or optically read.) The Kernel article mentioned that students at the university had made the gate and other garden enclosures, including an ivy-covered fence. In 1934, he was elected president of the American Dahlia Society and to this date, that same group presents the Derrill Hart Medal "to the cultivar that has the highest average trial garden score in the 7 accredited Trial Gardens located in several areas across the United States and Canada during the previous year" per the society's webpage. More information on this and other dahlia prizes is at this link and one message board has a brief discussion of what winning this medal means in regard to the actual flowers. Here is a picture of one Derrill Hart Medal winner, the Hollyhill Cotton Candy Dahlia. The book History of Woodford County, Kentucky lists a D.W. Hart among the deacons of the Pisgah Presbyterian Church in that county, so Derrill may have been involved with the church while he still lived in Kentucky. His father and maternal grandfather were elders in the same institution, so he did have family ties there. His obituaries noted he passed away in New York, but had returned to Kentucky often after he had left the state including for Pisgah's 150th anniversary in 1934. One of his survivors listed in his obituary was his widow, Rita Allaine D'Aleze Hart from Anjers, France, so it seems reasonable to guess that he met her during his time in the service. Perhaps he was in France or elsewhere overseas in the navy when the 1920 census took place. The 1930 census shows Derrill Hart living on Block D of West 96th Street in Manhattan and indicates he worked as a salesman in the in advertising industry. (He lived at 700 West End Avenue by the time of his death.) It does correctly show he was born in Kentucky, though his listed age of 36 is slightly different than the 1892 birth date would indicate. The census took place in May, before Derrill turned 38 in December, and a one year difference is not uncommon on such records. error by the census taker or whoever provided the information, as his dad was from Alabama. It does list him as a veteran and "WW" as the war, presumably standing for "World War" since the second such war was still in the future. It shows that Derrill lived in a rented home. In a sign of the times, it also shows he owned a radio set, but does not show him having any children. One possible issue with this record is its listing of Derrill's wife as Lauri, recording that they had been married for 4 years. Perhaps she died and he got remarried, to Rita, sometime after the census. One link supports this possibility, as it shows a Derrill W.Hart marrying Rita Newberry on December 20, 1933. Of course, that last name does not match the one in the obituary, but the first name does, and the date casts doubt on the idea that they met during the war. Further confusion comes from an undated Kentucky Alumnus page on UK's website that reports "recent marriages" and includes a listing: "Rita Allene D'Aleze to Derrill Wason Hart '12." The latest date I could find on that page was a birth listed on December 9, 1933, so this article was likely from 1934. Were Rita Newberry and Rita Allene D'Aleze the same person? Did one of these records, perhaps the one from New York, simply show the wrong name? Perhaps future research will help clarify this issue. Derrill Wason Hart passed away on June 16, 1936 at his home in New York, only 43 years old. His obituary in the Kernel called the garden he gave to UK "a gesture of the love he bore the university" and reported that his work "brought fame to the university in agricultural circles by the successful experiments that were carried on through this garden." He was "invaluable" as a friend of the university and would "be missed by those who knew him." Derrill Wason Hart led a short but full life, playing collegiate athletics, earning two college degrees, serving in the navy during Workd War I, having a successful career in the publishing and advertising industries and leaving a legacy in the world of dahlias. His military career was one similarity he shared with his father and uncles, which future posts here will explore. See future posts for more details on Derrill's family and how it ties this post into my Civil War obsession.